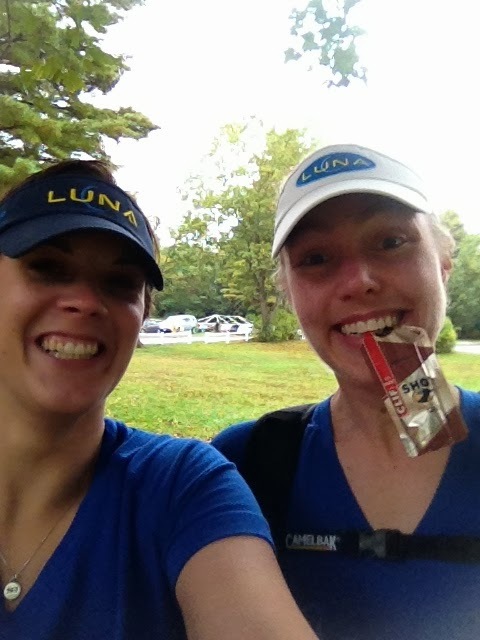 The Boston LUNA Chix provided some LUNA bars for the Hopkinton Road Runners race in October. As a thank you for the bars the team was offered a team spot on their Run Around Hopkinton Marathon Relay. Teams of 2-6 complete the 26.2 mi course around Hopkinton. We quickly realized a lot of the team was going to be racing in NH the same day as the race so only 2 of us were able to take advantage of the offer. Lisa and I hated to give up the free entry to a race. Lisa was in the middle of training for her 50k and had done a trail marathon training run the weekend before. I had offered to do around 10 miles since I was getting ready to do Army Ten Miler. Race day arrived. Lisa got the word from her coach that it would be pretty cool to do back to back weekends of marathons. She thought what the heck and would give it a shot. I was still trying to figure out the course logistics to do the 10 miles I wanted to do. When it finally dawned on me- it’s a 2 loop course. Well guess I am running a half marathon then, it was the only thing that worked logistically. We walked up to packet pickup and realized the race was pretty small, about 30 teams. 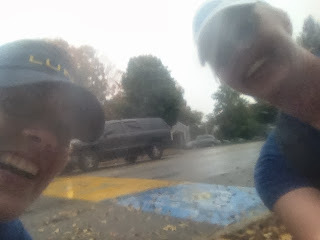 The Hopkinton Road Runners were so happy to have us there and thanked us for the bars again and again. I told Lisa I would join her for the second loop. That way if she didn’t want to finish a full 26.2 we would finish the race, and she would have company on the second loop. There were a few pre race announcements Lisa put our baton in her Camelback and she ran off. It was a misty morning and I headed back to the car to hang out, stay warm, and eat some more. She had hoped to be coming in for the half marathon around 2 hours. She texted me to let me know she was right on pace. Then it started to pour rain! I headed to the start/finish area. The race director asked if we were just splitting the race in half. I told him she was going to run the whole 26.2 and I would join her for the 2nd 13.1. He asked that we have one of us run through transition points to not completely screw up the timers. Lisa smiling came through the chute and we headed out. The start/finish was at the camp I worked at from 16-20 as a lifeguard. I knew the property pretty well and the surrounding area. We headed down a wood chip trail that connected to a trail through the woods for the first mile or so, then popped out on the street. We kept a decent pace and chatted about how Lisa had just gotten soaked in the downpour. How she was feeling? How this back to back marathon thing was feeling? We hit the first water stop and I realized this is a small race with people planning on running 6 or less miles at a time. It was just water at the aid stations. Everyone was so nice. Everyone remembered Lisa coming through on the first time and was shocked to see her again. We ran and chatted. It was a nice course on a nice fall day. We went through Hopkinton State Park. I run through there on a few triathlons so I knew the area. Coming out of the park was supposed to be the TOUGH leg. It was we climbed up 135 in Hopkinton- reverse to the start line of the Boston Marathon. We stopped at the top to take a picture. The poor cops thought I had collapsed, and came over to offer help. We hit the High School for the last transition point. As we came out of the transition Lisa mentioned she had seen apples in the front yard of a house so we stopped to pick one to eat. I commented this wasn’t in any of my triathlon nutrition plans. She welcomed me to the world of ultra marathon eating. We snacked on the apples for a bit. We stopped at the last water station and talked to the mom and her daughters that were running it. As we came close to the Finish, about a mile out, I grabbed the baton from Lisa to be sure we showed that we had 2 people on the team. We crossed the finish together in a full out sprint. I pushed Lisa a little to sprint with me at the finish (she wasn’t too happy about it after the 26.2 mi). Everyone was coming up to us but mostly Lisa since she was the only person who had run the whole 26.2 mi course. They were shocked! They were surprised I had run 13.1 also. I guess we were the only ones who decided to be a team of 2 and split things that way. We had 3 teams behind us when we finished. Lisa finished in 4:15. A great marathon time for just dong one the weekend before and on a course that wasn’t 100% road. I did my half marathon in 2:08. Just about 6min off from my half marathon PR. Not bad for randomly deciding to do a half marathon this weekend and again not 100% on road. Like I said I had only planned to do about 10 miles. 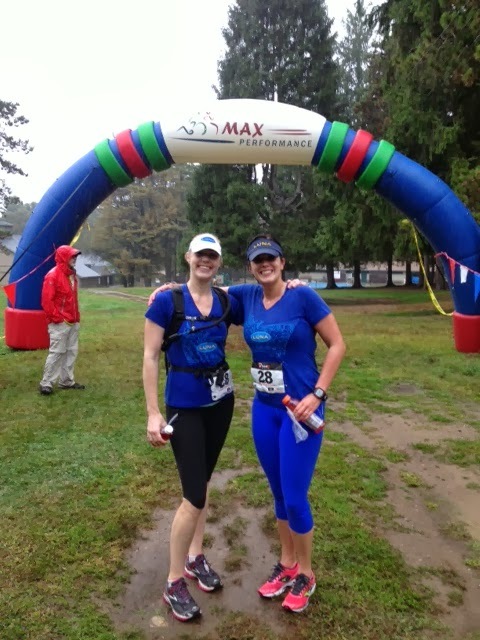 I looked at the half marathon as a training event and just ran with Lisa to enjoy the distance. I had a great time running with her like always! Both of us had great training runs! We both realized that we are nuts and it isn’t normal running behavior to go out and run a marathon or a half marathon as a training day. But hey both of us had the ability to on that day and we had a lot of fun doing it!